It’s summer in Seattle and we’re happier than ever to be developing software. We’re excited for a big app release later this year, a few new operating systems, encryption in OmniFocus hitting Public Test, quesadillas for lunch, the ongoing discussion about collaboration in OmniFocus, and 71 localized manuals and guides on the iBooks Store. For non-English speakers, OmniPlan for iOS joins its Mac sibling in being completely localized for Deutsch, English, Español, Français, 日本語, Nederlands, Italiano, Русский, and 简体中文. Many of our customers rely on interoperability with coworkers or partners on Windows machines. Or, maybe they just don’t have the ability to work exclusively on a Mac, iPad, or iPhone. With that in mind, we work hard to bring you compatibility with the latest Project® file formats so that once the file is in, you can continue working away in the best app for designing and maintaining project plans. OmniPlan 3.6 contains other improvements to Project compatibility and overall stability: check for updates or download the app directly. Help Us Test App Lock in OmniPlan! To better protect data, we’re finishing up adding another layer to your documents via password and Touch ID with App Lock. No longer will toddlers with prying eyes access ACME Project X. But we do need to make sure both the workflow and implementation are smooth and bug-free. Feel like wading into the pool? Read a bit more about App Lock and sign up. Traffic between OmniFocus and the Omni Sync Server has always been encrypted, but to provide true privacy and peace of mind for everyone we wanted to do even better. We’re putting even stronger protections in place by encrypting your data with a key that is only available to your devices, not our server, since only things which should ever have access to your OmniFocus tasks are the devices you own and control: your phone, your Mac, your tablet. It’s not just limited to Omni Sync Server, either. With encryption implemented within the app itself, it works as-is with custom WebDAV servers. With the last few technical details in place last month, we started inviting just a few folks to try it out — now it’s open to you. If you’re feeling up for testing the new, encrypted database format, just sign up! Powerful automation has existed for years on the Mac with AppleScript. 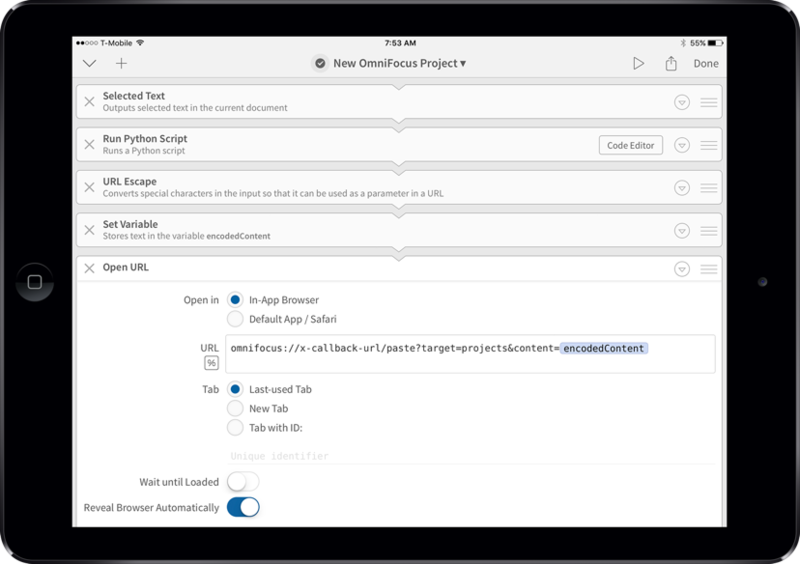 On iOS things are still in the early days, but thanks to quickly advancing efforts from apps like Workflow, Editorial, and Drafts, incredible things are now possible. For instance, instead of having to worry about duplicating common projects over and over again—like an onboarding project you customize for new hires—folks have already put together complex templating that can easily be adapted to fit other needs with just a few customizations. How’d we do it? With 2.14, OmniFocus now includes best-of-class support for URL schemes and x-callback-URLs. At its simplest, this means that you can create a workflow that adds a new action to your OmniFocus Inbox. But we didn’t just add support for two-way communication between OmniFocus and other apps; we added support for automating a whole lot more of what you already do in OmniFocus. And while there are obvious workflows that generate project templates, we’ve especially enjoyed extensions that save the currently playing song title from a local radio station (Seattle’s own KEXP!) to the Inbox, and allow you to plan your day in Fantastical. And we’re still improving on our end. Soon you’ll be able to auto-save actions as well! Pick up your Apple Pencil and start drawing in OmniGraffle, ‘cause things just got a lot better. Rather than navigating popovers to draw arrows, fill in shapes, and change an objects’ stroke, use your Pencil! Draw lines between objects, squiggles inside objects to add a sketchy fill, or darken a stroke by tracing over it again with your Pencil. Plus, we’ve increased the amount of bézier points to improve accuracy when sketching and writing. While we’ve been discussing and digesting a lot of feature requests and feedback from you over the past few years, we’re currently working on our next major version: OmniGraffle 7. Join the discussion and let us know what you’d most like to see!